I remember that this was a college graduation gift to myself via the Dreamcast Direct mail order site. After all, Darkstalkers was my favourite fighting game series and now for the first time EVER, you could play a fighting game over the Internet. Sure it was a Japanese only game, but hey, I’d figured out how to connect my Dreamcast over the net nearly a year before with the almighty Toukon Retsuden 4, keeping Don Frye as world champion in an online e-fed for nearly the length of its existent, no doubt annoying my opponents across the Pacific that a “foreign devil” held that IWGP strap both in terms of player and character. I spent many an hour on the Internet playing this game back when this idea was hard for most gamers to grasp the concept of. 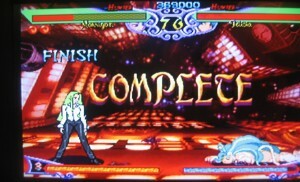 Better yet, I was playing this on the Dreamcast’s 56K modem compared to today’s DSL, cable and FIOS internet options. My how times have changed. Now I haven’t picked this game up in five years – not since the last server for this game went dim and the PSP version of this game became available. However, since this was Capcom’s first ever online fighting game and I found a fan-based server for the game that lets me play the same way I can still boot up Phantasy Star Online, I decided to pull this rare (only 5,000 copies were ever made) little gem and give Vampire Chronicle its own day in the sun for our 30 Days of Dreamcast feature. How has it aged? Let’s take a look! By the way, as there are no quality screenshots of the game online anywhere, I took my own. That being said…there are STILL NO QUALITY SCREENSHOTS of the game online. I tried though! There’s no real plot to this entry into the Darkstalkers series. 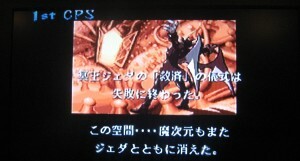 In fact, none of the characters retain their endings or story at all even though it uses the same engine and graphics as Darkstalkers 3 or Vampire Saviour as it was known in Japan. You just go throw your six randomly determined battles, fight Jedah and that’s it. Credits roll and you’re done. It’s about as disappointing as the lackluster King of Fighters XII if you were playing this game primarily for the single player mode, which is what you’re reduced to unless you know someone that knows someone. That’s really it. This was a bare bones game AT BEST because it was geared solely for online play. This disappointed a lot of gamers who wanted to see character ends instead of a shot of Jedah dying and then Bulletta (B.B. Hood) And Donovan Bane standing back to back. I have to admit, I swore the first time I played this with Demitri and saw I wasn’t getting a ending. Boo-Urns. Thankfully everything was put back in, with a little extra to boot, when Vampire Chronicle was eventually remade for the PSP. In its day, Vampire Chronicle was lackluster in terms of modes and plot, but rich in the ability to introduce many a Japanese (or shifty American) to the potential of online gaming. These days, it’s more a curiosity or nostalgic reminder of what was once fresh and original, but these days is pretty bland. It’s funny. A decade and a half ago, the Darkstalkers franchise was pretty much universally considered the best looking fighting series out there. The acclaim for the visuals was so strong that Street Fighter Alpha the Marvel X Capcom games were based off the DS visual styles. These days, things have changed quite a bit, with Darkstalkers being known for the series Capcom took forever to update the sprites off. Remember everyone’s collective “WTF” when you finally encountered Morrigan in Capcom Vs. SNK? Wow, was that an eyesore. Sadly Vampire Chronicle is no different. 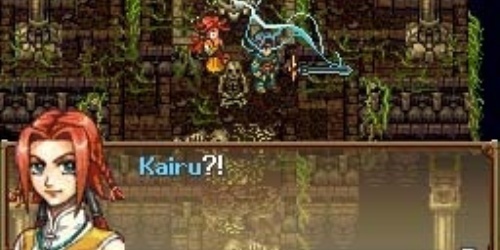 It’s the same sprites we’ve seen for years. Even worse they’re PSX DS3/Vampire Saviour quality compared to the Saturn’s version (or even Night Warriors) which neither makes sense, nor is good for the game. As a late-gen Dreamcast game, the sprites were hard on the eyes to begin with simply because it didn’t even try to push the power of the system or improve on what had been done in the past. The backgrounds are directly lifted from Vampire Saviour and although pretty, they really clash with the older sprites the characters use. There’s a bit of a visual disconnect that makes playing this game hard on the eyes. In terms of frame rate, everything holds up nicely and I never once encountered slowdown. Even when i used to play this game on line, everything was quite fluid which impressed me. Nowadays in the era of high speed internet, the fact you could get a fighting game to play perfectly on a 56K modem is crazy impressive. Take a note there SNK with your inability to get an online fighting game running smoothly in both the last generation and the current KoF crapfest. Although Vampire Chronicle is fun to play, it’s not that fun to look at. 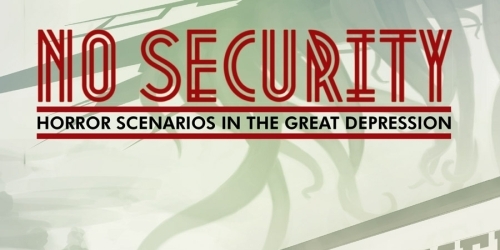 It’s a shame that how this series degenerated from visually stunning to a bit of a joke for the genre. As always the music in the Vampire series is excellent. Each stage’s background track is impressive and fun to list to. There is BGM test in the options section of the game where you can just listen to the fun little tunes embedded on this disc. The voice acting is great too. I always loved the weird little one-liners this game was filled with. Of course they’re all in Japanese, but hey. The only thing I miss is Scott McNeil as Lord Raptor. Aurally, Vampire Chronicle boasts one of the best soundtracks for a fighting game outside a King of Fighters title. Although the dialogue will be lost on those of you who don’t know Japanese, you’ll still enjoy what’s being said. After all, who knew what “Hadouken” meant the first time they heard Ryu or Ken say it? This is really the meat of the game. 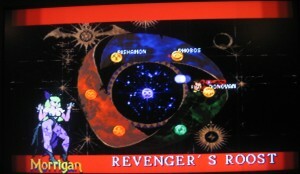 Not only do you have all eighteen of the main characters (along with a few hidden ones like Dark Talbain, Marionette and Shadow) but you can also unlock EX versions of each characters movesets IN ADDITION to all four of the original fighting styles for the series: Darkstalkers, Night Warriors, Vampire Saviour, and Vampire Saviour 2/Vampire Hunter 2. (Quick history lesson: The US Darkstalkers 3 is actually a combination of VS, VS2 and VH2.) All the styles are perfectly intact, and for characters who didn’t appear in a game previously (Say Pyron in Vampire Saviour or Donovan Bane in Darkstalkers. ), they are given a moveset that fits that entry in the series perfectly. It’s a lot of fun to try all the different movesets and gameplay styles available to each character, but in the end, I’ve yet to meet anyone who didn’t stick with Night Warriors as their preferred style as it’s not only the high point of the Darkstalkers series, but arguably the highpoint for the 32-bit era of fighting games across the board. The only real problem you are going to encounter is playing the Vampire/Darkstalkers control scheme on the normal Dreamcast controller. Because many of the special moves requires hitting all three punch or kick buttons at once, there is no real quality way to map the joystick or to hit the finisher with consistent accuracy. If you have the arcade stick, it’s still a bit of an issues as with only six buttons, there’s nothing for mapping a “MP + MK” or a “LP + MP + HP” option unless you want to forgot a standard punch of kick to begin with. Sucky, and it’s one of the reasons I still prefer Night Warriors overall as god knows the Saturn pad was a godsend for fighting games. You’ll also notice that pulling off even standard special or EX moves with a Dreamcast controller can be a bit of a pain whereas it’s nearly flawless with the arcade pad. It’s odd that this game wasn’t designed to work very well with the DC controller even though the MvC and SNK Vs. Capcom games were. You’d think considering this was a Dreamcast exclusive meant to showcase online gaming that Capcom would have, you know, designed the game to work with the default controller for the system better. Because of the DC controller issues with Vampire Chronicle you’ll rarely use Vampire controls and it was rare to see it online. Due to the weirdness of how rounds worked in Vampire Saviour, Night Warriors is still the undisputed choice for how to play this game, and it’s the one you’ll see both longtime fans or newcomers to the series choosing after messing with this title for a while. It’s also when you’ll see Demitri at his best, so if you’re looking to recover from his appearance in SVC Chaos, this will make you feel better inside. Overall the game is nearly impeccable with an arcade stick, but at times very hard to play (depending on control scheme) with a DC controller. I can’t deny that with the death of Dreamcast servers many years ago, that the replay value of this game tanked. After all, it was designed to be an online game first and foremost and now that option is gone. Without any endings to the Arcade Mode, it too is nearly worthless for playing through. However, if you have the game and local friends who enjoy 2-D fighting goodness, then you’ll be amazed at the replay value here. With over twenty characters and four play styles for each, you’ll be spending a lot of time just testing out the cast of VC, much less trying to master nay of them. For those of you that know how to still get online with your Dreamcast or maybe even have a dedicated Dreamcast server set up for you and other Sega loyalists, then you can experience the game as it was meant to be played. Sure it hasn’t aged as well as I would have hoped, but this is basically the game that was the precursor to the current generation of Capcom online fighters. As long as you can live without online play and an Arcade Mode ending, you’ll see that Vampire Chronicle still has a lot of life in it. One of the reasons I loved playing this in the arcade compared to any of the Street Fighter Mortal Kombat, Tekken or SNK games was because of character balance here. In most fighters there is always some character that’s a bit overpowered or that completely disrupts the game entirely. MKI has the whole Sub-Zero issue. MVC2 has issues with Cable and Iron Man. SFIV had Sagat being more powerful than he had been in the past, but as a person who has been playing Sagat as his primary character since SF2CE, I both welcome the spotlight and became annoyed by the flightly bandwagoners playing Sagat because he gave them an advantage rather than actually liking the character. With any of the Darkstalkers games, you’ll quickly find that no one particular character is that much greater than any other. Sure people prefer Demitri and Morrigan as they are the Ken and Ryu of the series, but honestly, people who played the DS series played because a particular character design and their respective animations kept them loyal to that monster. I’ve seen tournaments or online matches where Sasquatch or Rikuo dominated. I myself prefer Donovan Bane and Jon Talbain and I know people that can take down nearly anyone they face with Hsien-Ko or Victor. 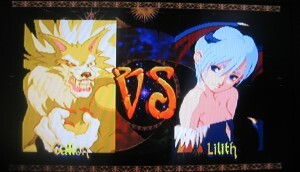 Vampire Chronicle really highlights how amazingly well done the entire Darkstalkers series is as, even by mixing series with say, a Night Warriors Lord Raptor taking on a Vampire Saviour 2 Jedah battle, it’s still a pretty even matchup where the winner is determined not by who a player chose, but by how well they know that character. The entire Vampire series is easily the best fighting game franchise I’ve ever encountered in terms of consistent character balance, and Vampire Chronicle showcases how much work Capcom put into this series when it wasn’t churning out slightly modified Street Fighter 2 games with each passing year. This was the first true remix fighting game where you could take characters from an entire franchise and use any of their prior move sets along with EX modes. This was also the first online fighting game, which has set the stage for everything since. Other than that, this game is simply a redux of everything the Darkstalkers franchise has ever done, for better or for worse. Still, the Vampire series was always Capcom’s testing ground for new things. This is the series where EX characters debuted. This is the first series to have a power gauge bar that allows you to pull of super special moves. Darkstalkers was the fighting game series you went to if you craved innovation and Vampire Chronicle was no exception with Capcom taking a chance on a little something called “online gaming.” Too bad that didn’t work out so well for them, huh? I mean who plays SSF2T: HD Remix or MVC2 online, right? Yes, it’s a mash up of all the previous Vampire games, but even then Vampire Chronicle was a ground breaking game in several major ways and once again set the stage for the rest of the fighting game genre to follow. Back in 2000-2001, I was pretty much playing this or Toukon Retsuden 4. I was really into online gaming, even if most of my time was spent playing against the Japanese or the very few other DC importers I know. I spent hours with friends trying out characters without any rhyme or reason. Unlike today where would-be fighting gamers stick to two or three characters and try for cheap cheese rather than skill, the Vampire Chronicle kids would switch between characters simply for the fun of trying say, Q-Bee or Jedah for a few games and then moving on to Morrigan or Felicia. It’s interesting to see how different of a dynamic there was with online fighting games nine years ago and the state they are in today. It’s far more popular in 2009 than in 2000, but it’s a lot less fun. Now, with the ability to play Dreamcast games online being all but extinct, the only real reason to play this is for arcade mode or local Vs. play. Sadly, neither of these are very excited due to the lack of endings or the likelihood that your friends will ask you to translate the Japanese win quote of characters after every round. In all, you might as well stick to the PSP version of this game or if you still have your Sega Saturn, you can give Night Warriors a go. As Vampire Chronicle goes for about fifty dollars on Ebay (used) these days, this is kind of a pricey Dreamcast game to pick up, especially when you have to have a bit of know-how to get online. However, with only 5,000 copies ever made, fifty dollars isn’t too bad of a price tag for a piece of nostalgia and/or Capcom classic gaming. The Vampire series has never really done that well outside of Asia, even though Morrigan and Felicia have picked up a cult following in the States. Part of it is because Capcom USA has never supported the franchise at all, while the other part is the series hit America during the midst of the crappy Street Fighter rip-off craze of the 1990’s and so it was lost in the shuffle. With the PSP remake of this game now available for about five to ten dollars at your local game store, all with crisper graphics and more modes of play, this is really only worth owning if you’ve had the game all this time or you’re a weirdo that collects games for the sake of just having them take up space instead of actually playing them and enjoying them. Nearly a decade ago, I would have pointed to Vampire Chronicle and proclaimed it the pinnacle of what 2-D fighting games should aspire to. Every character from the franchise with every move set they ever possessed combined with the ability to play total strangers across this new fangled world wide web. After re-playing it for this review/Dreamcast feature I have to say, with a great deal of sadness in my heart. It just hasn’t aged well. It’s definitely not worth the exorbitant price tag that accompanies it and the lack of easy online access really kills the game as that was what it was primarily designed for. It’s not as badly affects as say Phantasy Star Online, but unless you know how to get your Dreamcast online and play against others (Google it kids! ), then it’s only worth picking this up or even playing if you’re a long time aficionado of the Darkstalkers franchise like myself. 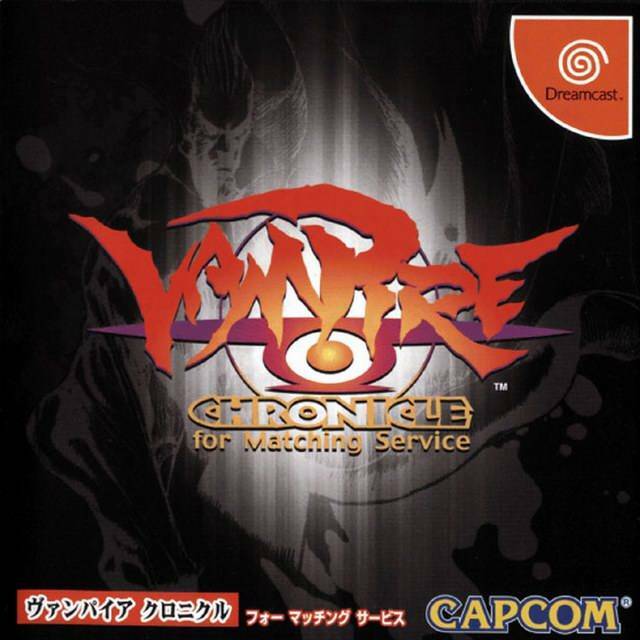 Whereas Vampire Chronicle was once the epitome of fighting games in late 2000, the lack of online support for the Dreamcast really kills a lot of the value this title once held. 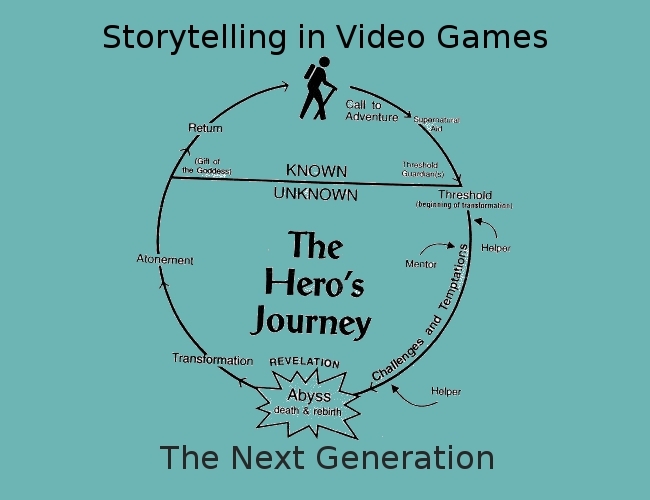 The lack of any character based endings in story mode makes it all the worse. Still, what is here is easily the most balanced and innovative Capcom fighter ever made. 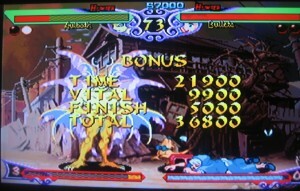 Although the graphics have aged poorly and it’s a pain to try and use Vampire/Darkstalkers mode with a normal Dreamcast controller, the game manages to play remarkably well and if this received the HD treatment Marvel Vs Capcom 2 and Super Street Fighter 2 Turbo were blessed with, then a whole new generation of gamers would be able to see why the Vampire series wasn’t necessarily the most popular, but it was by far the most solid in terms of gameplay and rewarding for the PvP experience. No wrestling games in the 30 days at all??? WTF??? None of us really like wrestling. We covered FPWD in our last big Dreamcast Feature, Royal Rumble isn’t worth covering, And I’m the only one on staff with a real knowledge of the AJ/NP games and I wanted to cover other titles. I almost did Toukem Retsuden but the other 9 I wrote about were more worthy of a full review. I guess its more of a personal impact thing for me…the DC sticks in my memory as a great import system for wrestling games. I love TR4 and FPD…hell I even enjoyed GG2000 for what it was. Still, a great feature on the system. I loved Giant Gram and TR4 as well. TR4 is my favourite wrestling game of all time. You can check our previous Dreamcast feature for coverage of both. In the end we tried not to repeat ourselves too much.